Since these invitations haven’t been mailed yet, I shouldn’t be posting this. But, I can’t resist!! Thanks to the suggestion of my mom, I decided to go with an airplane theme for my son’s second birthday. I am so excited! Here is the invitation I designed. 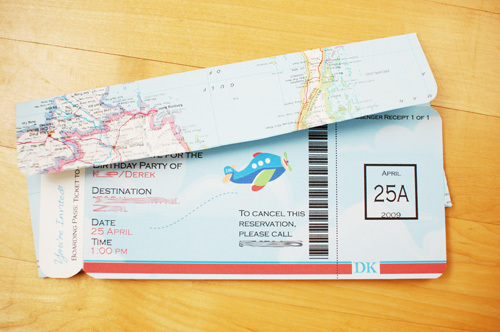 It has the look of an actual boarding pass, just a little cuter! I had trouble finding envelopes, so I decided to make my own! As much as I hated ruining the atlas, I think they turned out great! His birthday isn’t until the end up April, but after that I will have tons of pictures. So check back! If you are interested in purchasing these, click here. I would love to purchace cards like these but the site says they are sold. Is there any way I can order some? I tried to purchase these on the website listed above and they say they are no longer available. Would you be able to send the template to me. They are EXACTLY what I am looking for my sons 3rd birthday. Thanks!!! where can I purchase these? They are perfect! Hello there, You’ve performed a fantastic job. I’ll definitely digg it and individually recommend to my friends. I am confident they will be benefited from this web site. I love the invite and envelope. Do you make the envelope design?